Winter and shorter hours of daylight brings benefits, one is more time indoors to catch up on some long overdue processing, particularly B&W conversions. The three images in this post go back quite a few years, two of them to 2013 and one even further to 2010. They all show the line of descent off the Weissmies, a popular 4000 metre peak above the Saas valley in the Valais Alps. All three images were taken with a telephoto lens from Hohsaas, easily reached by uplifts from Saas Grund. 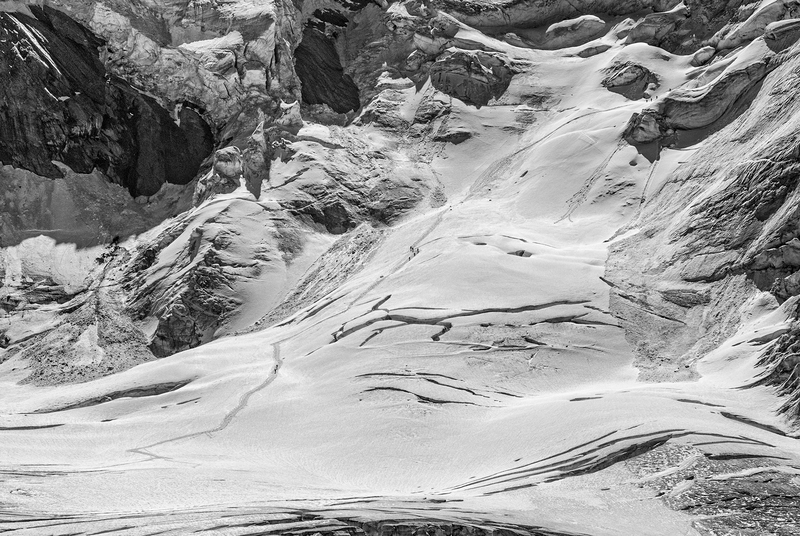 In the Alps, black and white photography simplifies the mountain-scape and climbers are reduced to mere dots in the vastness of the mountains. 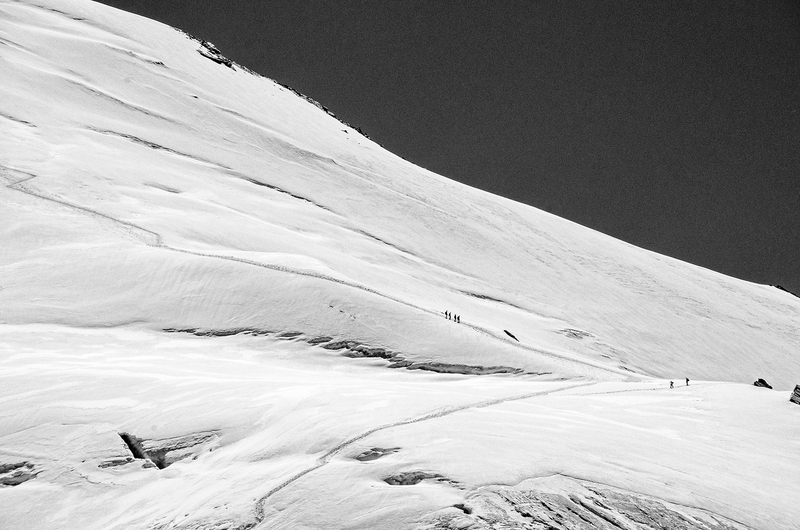 Click on the images to see an enlargement to discover the mountaineers. The route takes a dramatic line through an area of ice cliffs and crevasses before reaching a lower plateau. Once on the lower plateau, the route skirts a heavily crevassed area to reach rocks (out of picture, leftwards) and the point at which rope and crampons can be removed and the remaining descent then continues on easy rocky paths. 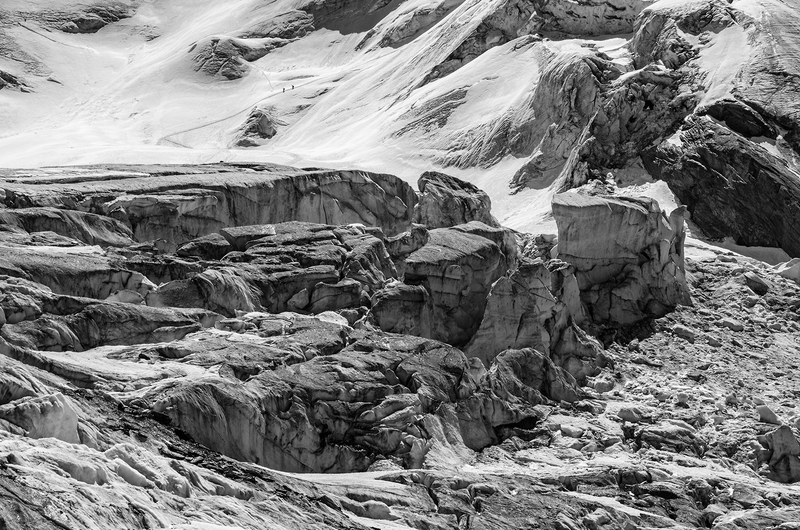 This entry was posted in Black & White, Swiss Alps - Summer and tagged Black and White Photography, Crevasse, Glacier, Hohsaas, Photography, Saas Grund, Saastal, Weissmies. Bookmark the permalink. It’s always fun to see these amazing landscapes – I’m glad you’re forced inside to work on them. The first appeals to me the most, because it has such an abstract look, and the dynamic nature of the snow is so clear. Welcome to my blog and many thanks for your kind comments, Melissa. Wow, this is a stunning landscape Andy. I visited the Austrian Alps many years ago but stayed at low level. It must be a truly exhilarating experience walking in these mountains. I’m pleased you caught up with the processing, it’s great to see these. Thanks Simon. I’ve climbed in the Alps over many years, but strangely I’ve never climbed this one – I really ought to put that right! On a good day there is something so very special being on a summit and looking down on the world. I’m especially fond of the last photo, with those interesting textures. It must be thrilling to be in the midst of such a landscape — and a little nerve-wracking from time to time. For understatement of the week, I’ll nominate, “Of course… at close to 13,000ft you get a bit short of breath.” I can only imagine. Fabulous, what stunning work both in the taking and the converting. Just stunning, Andy…nearly heartbreakingly beautiful…. Thank you for sharing them with us…. Thanks so much Scott. A very Happy Holiday to you and your family. You’re very welcome, Andy…and wishing you the same.